Tracking ships around the world in real-time. ShippingExplorer uses AIS data (automatic identification system) to determine positions and provide exhaustive information about ships. Based on AIS, our system builds a map of ship movements in real-time on seas and oceans and allows for locating and detailed monitoring of ships and ports. Our application has several map providers and color schemes to show AIS data. Additional layers with information about weather, waves, and wind are available. ShippingExplorer offers the tools to plan routes with ETA in ports and bunker calculations. The program allows to search for ships based on a variety of criteria (by name, MMSI, IMO, type, register information, destination, etc.). For example, allowing you to see all passenger ships headed to Lisbon. 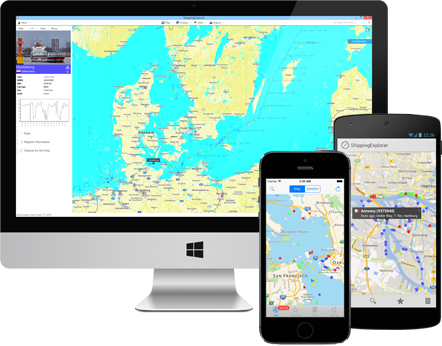 We have a flexible configuration system for notifications via SMS and e-mail for tracking ship positions and behavior in real-time. For example, you can be notified when your ship enters a specific area, changed its speed or course. Besides positions of ships on our maps in real-time, ShippingExplorer has archived information about ships for several years.